It was two weeks before Christmas and Sabrina's family had no idea that their extended family would be forced to sing carols from their backyard and leave gifts on the porch because having family germs in the house would be too much for Sabrina’s body to bear. At two and a half years old, Sabrina caught what was thought to be a cold. But when her brother's "winter sniffles" subsided, Sabrina's only persisted. She became increasingly sicker. Sabrina had always been a rough-and-tumble child, but these bruises - this fever - this "flu" were nothing like the norm. Her mother could see it in her eyes; Sabrina was sicker than she would ever imagine. Just 4 days after being sent home with antibiotics for a flu that never existed, Sabrina's parents received what they thought was the worst news that any parent could ever receive: "She has Acute Lymphoblastic Leukemia." Sabrina's mother drowned out the chatter, the sound of others making their way through the hospital and listened to every single word that left the doctor's mouth because she knew that her daughter's life depended on it. And when the doctor was finished speaking, she fell to the floor and sobbed hysterically as tears silently ran down her husband's face. She looked over at Sabrina - Limp. Spacey. Lifeless. Sabrina's mother tried frantically to wrap her mind around her jumbled thoughts. But all that she knew of cancer at the time was that it was unmerciful killer. In her heart, she thought, “This is it. Sabrina is dying.” She began to look around and listen to the stories of other children who shared the hospital floor, wondering what would happen next. Just the night before, they didn't even know Sabrina's blood type. And within hours, they were forced to hold her down on a hospital bed while the doctors took spinal fluid and bone marrow from Sabrina's tiny body. She needed chemotherapy right away. Her immune system was ZERO. She spent the entire Christmas season isolated - too sick for visitors. Sabrina suffered as the nurses poked and prodded as doctors surgically implanted a port and tubes into her chest, leading to her heart, for easier access to blood and injecting chemotherapy. She was tired, weak, and afraid. Her parents were forced to have some of the most unimaginable conversations with her as begged for them to make it stop - "You are not protecting me!" After Christmas, Sabrina's family took not one day for granted. They made new traditions. They invented memories that would last a lifetime. When Sabrina was well enough, they ordered take-out, sat in the parking lot of a food court and shopping center (because her body couldn’t fight the germs to go inside), and ate dinner in the back of her father's truck. They danced under the stars while people watched and wondered. Every occasion became a special occasion for Sabrina and her family - a lesson that we can all find value in living. Sabrina is now 5 years old. Her family continues to be haunted by fear of relapse and fear of quality of life. They know now that childhood cancer is not rare. That it is the number one killer of children. That it is real. That it does not knock before it kicks in the door. 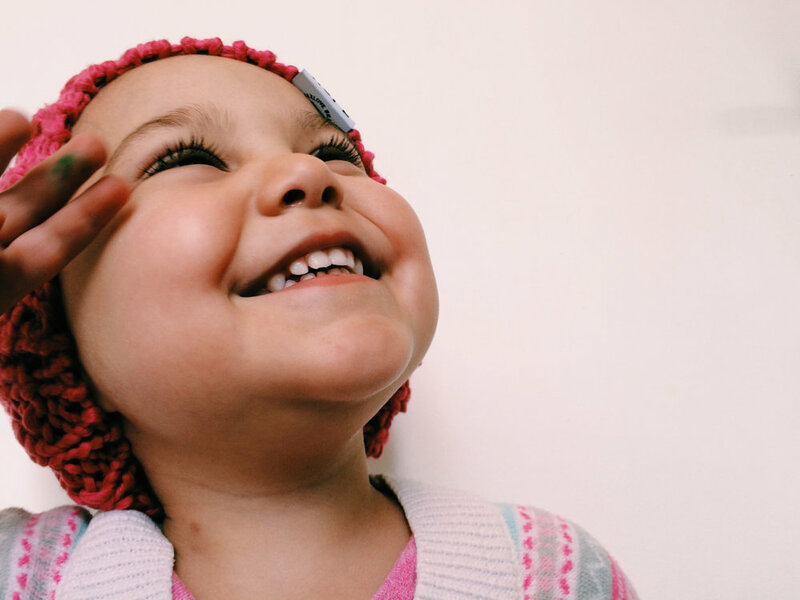 Sabrina is cancer-free and thriving. But her family has been forever changed. They will never forget the words that altered their journey: "Just love your daughter, and spend as much time with her as you can," the ER doctor said when her mother asked what was going on. For Sabrina, a Rooms to Thrive will pave the way for her to walk a new path. Her room will be transformed to represent a place where she was never imprisoned by illness. And for her brother and sister, who sacrificed so much to support their sister during that time, they, too, will have a new space to Thrive right alongside her. Help us give Sabrina a Rooms to Thrive™ by donating here today.